Start now a joint-gentle whole body training and improve your fitness. Please choose the desired price range. The movement quality of an elliptical cross trainer is decisive for a comfortable experience while exercising. Elliptical cross trainers of a high movement quality are more silent and run smoother, i.e.. Balance mass, transmission ratio, ball bearings as well as quality of material and workmanship are important features of the movement quality of an elliptical cross trainer. Choose your elliptical cross trainer according to the given floor space. The type of use includes intensity, duration, and frequency of use, i.e.. 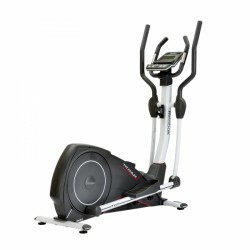 Solely elliptical cross trainers marked as professional are suitable for gyms. Those machines are also optimal for intensive home use, because they are best in quality of material and workmanship as well as stability, and durability. Semi-professional elliptical cross trainers are suitable for ambitious home users. Due to their high loadability, easy operation, and joint-gentle movement, they are also used at hotels, clubs, company's facilities, and for therapy. Some elliptical cross trainers of our range of products are especially designed for high loads. Elliptical cross trainers of a high loadability are also great for ambitious home use, because they are of a very high stability and high-quality workmanship. Our qualified staff are happily at your disposal in our Livesupport-Chat regarding all questions about sport and fitness. 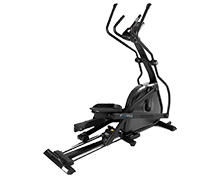 The Reebok elliptical cross trainer TX1.0 is a starter fitness equipment of easy use and compact dimensions. You achieve effectively your training target with heart rate measuring and 20 varied programs. The equipment of an elliptical cross trainer includes balance unit, brake system, training computer (display, programmes, etc. ), and extras like transport wheels, book holders, etc.. A good equipment makes exercising more varied and more comfortable. Your workout becomes more effective with pulse measuring. Innovation is a special criterion of the Sport-Tiedje elliptical cross trainer test rating. Here, we only rate equipment, which is characterized by technical innovations, which are really important for the further development of elliptical cross trainers. The higher the test rating of the elliptical cross trainer, the more advanced the development already is! The balance unit consists of balance mass, pedal bearing, ball bearing, etc. and is very important for concentric run. Transmission ratio and stride length and stride width in combination with stride height contribute to a concentric run. When the elliptical cross trainer offers a good concentric run, exercising is very joint-gentle. Muscle activity is distinctively increased as well. The stability of the crosstrainer is achieved by sturdy feet, high own weight, and a stable frame construction. A sturdy elliptical cross trainer is not only durable - it is stable even for challenging workout sessions and provides a higher weight load capacity. Most modern technology and stylish design make Reebok crosstrainers an excellent fitness equipment for exercising at home. Crosstrainers get more and more popular. A convincing argument for exercising with a crosstrainer is the more effective workout which is made possible by an elliptical - another word for crosstrainers. Exercises with a crosstrainer strengthen leg muscles as well as torso and arms thanks to the pedal arms. Reebok crosstrainers: Shape meets functionality !